This entry was posted in Farming Award, uW and tagged Farming and Countryside Award, making butter. Bookmark the permalink. Was It yummy it looks super super nice? 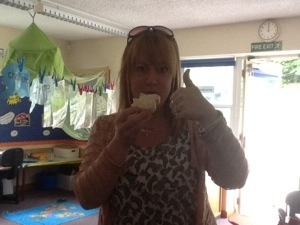 how was the butter miss lomas? 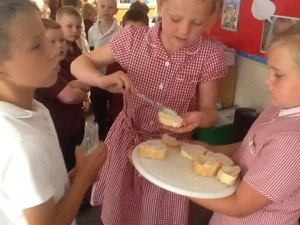 Did you like the butter miss lomas? We are happy that you enjoyed our butter. And you are welcome to try our other food. Did you think our butter was nice? Thank you for trying some. 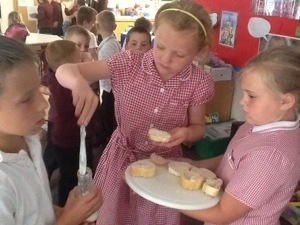 Did you like the creamy butter and some bread we are very greatful to let you have some. For a start you need some whipped cream (double) and then pour it in a container such as a glass jar or something else remember to have a lid on top! Then start shaking the jar for fifteen minutes or so and wait until it splits and goes yellow nevertheless you can get your class to do it so it isn’t that tiring but tell them to hold on tight if it cracks you will have a problem lets get back to how to making it as soon as it acts like a big lump of I don’t know lard or something slipping around in the jar! You can then add some herbs like rosemary or cress I hope you enjoy making your butter oh just another thing make sure the whipped cream is cold ! Butter , which is as yummy as chocolate cake , is easy to make but it takes some time!